Prior to entering St. Charles Borromeo Seminary in August 2016, I thought about entering the discernment process twice before. The first time was around the time I graduated from high school in 2009, and the second time was when I graduated from Lock Haven University in 2013. While the thought of entering the seminary was present in my mind at both times, it was not the right time for me to enter. From 2014 to 2016 I was employed by the Osceola County School District in Kissimmee, Florida as a fifth-grade teacher. It was in Florida that my faith life began to develop in earnest. While my time being an educator was wonderful, God had a different path for me. In October 2015, I heard the call again to enter the seminary and this time it was different; it felt right. So while I was still in Florida I applied to St. Charles Borromeo Seminary and the Allentown Diocese, was accepted for both, and began my priestly formation in August 2016. There are many people that have been important in my life, and especially in my discernment to the priesthood. First and foremost are my parents and grandparents. The faith life truly begins at home, and I am very blessed to have a family that places an importance on living the Catholic faith in today’s world. Their support has been instrumental in my continued discernment of my vocation. Additionally, Thomas and Karen Frey, our good family friends, have also been an inspiration to my life. As fellow teachers, Tom and I often discuss the latest educational news and how best to reach those put in our care. But more so than that, I have learned how to live an authentically Catholic life in the 21st century by simply being their neighbor. Last is Msgr. Joseph Smith, pastor emeritus of my home parish of St. Catharine of Siena, Reading. Msgr. Smith was the first person to introduce me to the priestly vocation. His example as a priest is truly inspiring, and is one of the primary reasons I am in the seminary today. I have several interests and hobbies. At the seminary I am on the soccer team and participate in our annual Vianney Cup tournament against other seminaries. I also play volleyball in our Overbrook Volleyball Association intramural season, as well as the occasional round of golf. I also am involved in the seminary’s choir and annual Christmas concert. I also enjoy using my skills as a teacher to increase my role in evangelization and bringing about more vocational awareness among students and young adults. Life as a seminarian is not much different than the life of a college student. We have classes four days a week with one day set aside for pastoral outreach in our apostolates. Mass and prayer time occur at various hours of the day, which helps keep the seminarians grounded in their discernment pursuits. When we are not in class or a religious obligation, most seminarians can be found hanging out with each other, studying, exercising and building great fraternal camaraderie. Overall, the seminary is a great place to be yourself by growing in the love of Jesus Christ. 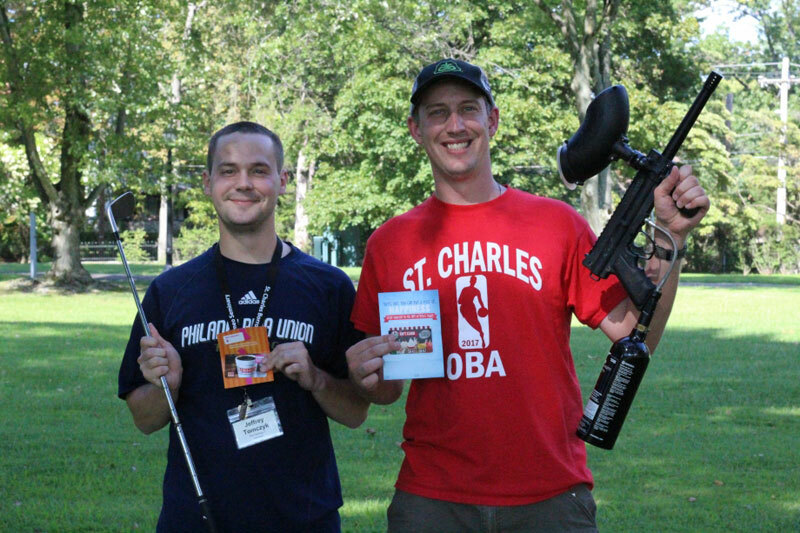 Jeffrey Tomczyk, left, seminarian for the Diocese of Allentown, celebrates winning the golf and paintball tournament at Charles Borromeo Seminary with Carson Kain, seminarian for the Diocese of Lincoln, Nebraska.